From out of meager beginnings, there comes fame and fortune. It's a story of Rags to Riches. 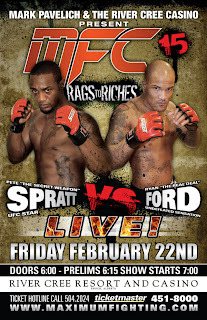 The Maximum Fighting Championship returns for its first show in 2008 with MFC 15: Rags to Riches on Friday, February 22 at the River Cree Resort and Casino in Edmonton/Enoch Canada. It will be another action-packed night of mixed martial arts. In the main event, Ryan "The Real Deal" Ford puts his undefeated record on the line as he faces seven-time UFC force Pete "The Secret Weapon" Spratt. It's a showdown that will prove who the No. 1 contender for the MFC lightweight title is - unbeaten Ryan "The Wrecker" Heck will go up against American sensation Mike Maestas. In a battle of the big men, Craig "The Big Z" Zellner will try to derail Ryan "The Big Deal" Jimmo. And fast-rising middleweight powerhouse Jason "The Show" Kuchera is back and looking for another knockout victory - this time against rival Allan Hope. Tickets are going fast - just a few remain so don't wait any longer. Our past seven straight shows have all been sellouts with tickets for MFC 14 gone three weeks ahead of the show.